Figures released by the Trussell Trust show that there has been a massive increase in food bank use in areas where UC has been rolled-out. Food bank use has increased by 13% over the last year across the country. However, in areas where UC has been fully rolled-out for at least 12 months, there has been a staggering 52% increase in food bank use. The findings have once again been dismissed by the DWP as anecdotal and based on too small a sample. However, the claim that people on UC are being particularly hard hit is supported by entirely separate research obtained from the National Housing Federation by Sky News. This shows that a huge 73% of housing association tenants on UC are in arrears, compared to 29% of those not on UC. And this is only going to get worse! Then they wonder when these children that suffer going with out grow up and go abroad to live like years ago when children that were ridiculed by schools dinner ladies for having free dinners because they were poor. My understanding is the arrears are caused by delays in processing claims for Universal Credit and are equally bad in the private sector. Therefore just proves how crap the system is we never had any of this years ago. Neither did we ever need to have food banks either. FOODBANK use could rise sharply in Coventry as the government’s new benefit system hits vulnerable people hardest over the winter period, a centre manager has predicted. 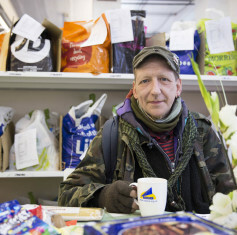 Hugh McNeil who runs the Trussel Trust foodbank on Sparkbrook Street near the city centre says it has seen a huge increase in use over the last few years for various reasons. With Universal Credit (UC) being rolled out in Coventry in July, he says he is only now starting to see the effects of the controversial new form of benefit payment, on top of a long squeeze on household budgets. He said: “We saw a drop in use this time last year, before the busy winter months. “But we have actually seen a rise this year after UC was introduced. The Trussel Trust says problems associated with UC have prompted the Coventry branch to partner up with Coventry Citizens Advice Bureau to provide a support scheme for those coming to the centre due to benefit complications and issues with applying. The new scheme named Resilience aims to respond to the projected increase in footfall into the foodbanks due to the arrival of UC, the Trussel Trust says. I've heard that Citizens Advice Bureau are sending claimants to the public library for advice! What libraries most have been closed. It's disgusting children in a cold country most of the time are having to use food banks so they can eat while vast amounts of money is leaving this country into warm countries that can afford the space race no wonder our NHS can't cope as coldness causes hardening of the arteries. What a bl**dy country we live in. Melisandre wrote: What libraries most have been closed. And Universal Credit can only be applied for online so if a person doesn't have internet access at home they are forced to use a terminal at a public library. Some library's charge in my experience. Benefits and Work received exclusive proof last week of just how woefully inadequate universal support is. A librarian contacted us to voice their concern that, after only ‘rudimentary’ training, they are having to support people with UC claims. In the process they are learning personal details about serious issues such as cancer and suicide attempts. Claimants are referred to the library for ‘digital support’ with UC claims by the DWP, the local authority and citizens advice bureaux. Sometimes staff have to type details into the form for claimants because, for example, they have had a stroke and are unable to use a keyboard. As well as being obliged to learn what they felt was highly inappropriate information about claimants, the librarian was also concerned that people were unlikely to get the correct award. “We don’t get to hear the outcome of claimants or get any feedback but I suspect that claims will be given the minimum as not all relevant information can be collected. “I find it very disturbing. “I personally have completed around 20 ADS (assisted digital support) trying to be sympathetic to each client and 'trying' to avoid seeing their personal circumstances. “I really think this is an invasion of someone's privacy. “However, most people are willing to share their personal business as they are bewildered with the process and in my opinion 'beaten'. “In our town CAB are actually sending clients to the library. “On top of all this people don't have the necessary ID to complete their application so are being referred back to the Jobcentre to have their ID verified which is in the next town and incurring additional expense for their travel.